Mississippi State University Presidential Scholars visit the Kennedy Caucus Room of the Russell Senate Office Building in Washington, D.C., March 8, 2019. Mississippi State University (MSU) Presidential Scholars recently visited Washington, D.C., to learn more about public service on Capitol Hill. Presidential Scholars are recipients of the highest undergraduate scholarships awarded at MSU. Every spring, these students travel to a great American city, including Washington, D.C., every fourth year. Presidential Scholars range from freshmen to seniors and represent many different majors. On Friday, March 8, 2019, the Stennis Center for Public Service hosted MSU’s Presidential Scholars at our nation’s capital to learn more about how they can prepare for and provide public service leadership in their careers. 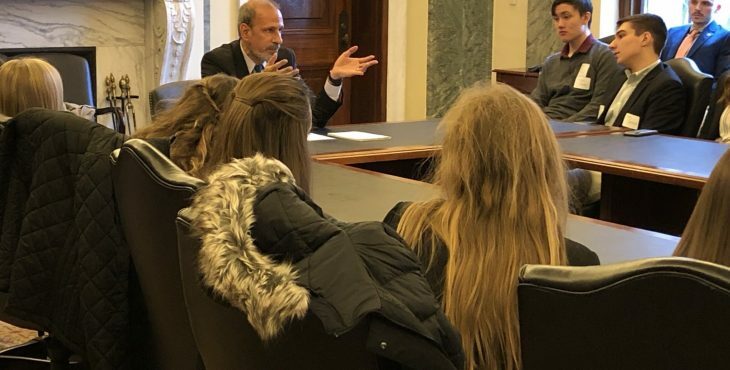 Mike McCord, Director of Civil-Military Programs, led a discussion with students on the history and role of the Senate Armed Services Committee. The Senate Armed Services Committee provides legislative oversight of our nation’s military. Senator John C. Stennis chaired the Senate Armed Services Committee from 1969-1981. Mike McCord, Director of Civil-Military Programs, speaks with Mississippi State University Presidential Scholars in the Senate Armed Services Committee Room of the Russell Senate Office Building in Washington, D.C., March 8, 2019. Presidential Scholars heard from Emerging Leaders on Capitol Hill. 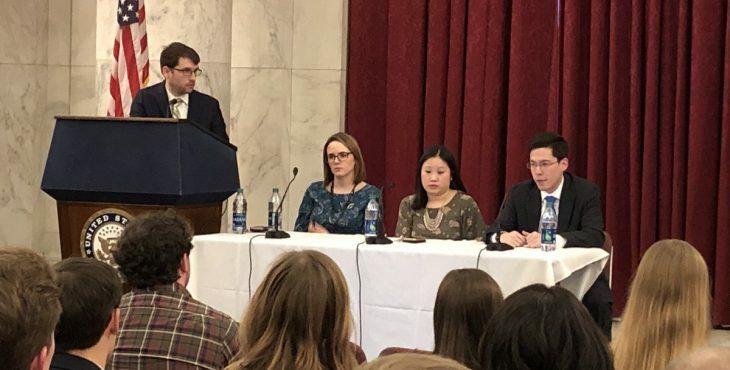 The panel of young congressional staff leaders shared their experiences in public service, including the pathways that led them to a public service career and what it is like to work for the U.S. Congress. Eric Jones, Program Assistant, left, moderates a panel with Katelynn Thorpe, Communications Director for U.S. Representative Nita Lowey (NY), left middle, Lindsay Linhares, Senior Policy Advisor for U.S. Senator Cindy Hyde-Smith (MS), right middle, and Tim Wang, Senior Legislative Assistant for U.S. Representative John Katko (NY), right, in Washington, D.C., March 8, 2019. Michael O’Hanlon, Senior Fellow and Director of Research in Foreign Policy at The Brookings Institution, led an interactive discussion on U.S. defense strategy, the use of military force and other national security policy issues. 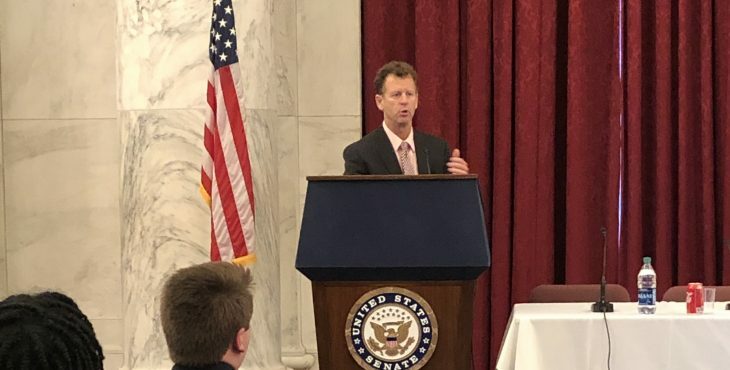 Michael O’Hanlon, Senior Fellow and Director of Research in Foreign Policy at The Brookings Institution, addresses Mississippi State University Presidential Scholars in Washington, D.C., March 8, 2019. U.S. Senator Roger Wicker (MS) and U.S. Representative Michael Guest (MS) also welcomed MSU’s Presidential Scholars to dinner with Mississippi congressional staff members on March 11, 2019. Both U.S. Senator Wicker and U.S. Representative Guest spoke with the students about the value of public service leadership in Mississippi. Students also had the opportunity to talk one-on-one with Mississippi congressional staff members. Mississippi State University Presidential Scholars meet with U.S. Senator Roger Wicker (MS) in Washington, D.C., March 11, 2019. U.S. Representative Michael Guest (MS) speaks with Mississippi State University Presidential Scholars in Washington, D.C., March 11, 2019.